1/23 - I did a pretty good job on the journal for Day 8, so I'm just going to copy that to move things along a bit. There will be lots of pictures, too, this was a photogenic kinda day. Up at dawn, underway by 7:30. 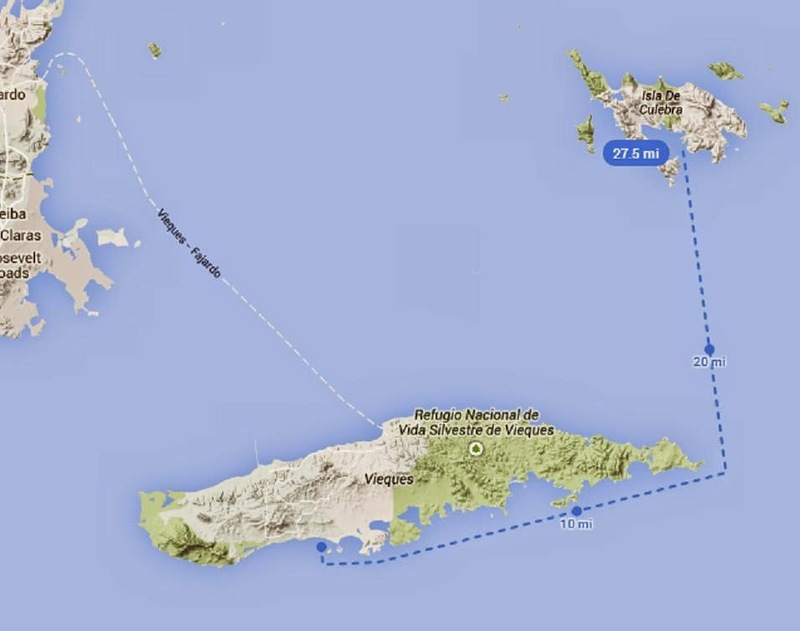 We are motorsailing back to the eastern tip of Vieques to save time, today we are going to Culebra, a 27 mile trip, so we're skipping the upwind leg to save tacking time. Under sail at 9:40, heading 20 degrees, not much wind. Tonight's destination is another Ensenada Honda, there is a restaurant there, Mamacita's, that is a particular favorite of Kat's. Arrived around 12:30, happily picked up a DRLN mooring ball just inside the harbor (we'd pretty much given up on the anchor and you're supposed use the mooring balls whenever you can anyways, better for the sea floor), we'd gotten there in plenty of time for more snorkeling. I'd finally gotten going on Unfamiliar Fishes (the book I'd picked up for the trip, been meaning to read this for ages, ever since I posted about it in March 2011), and while everybody else floated around the boat with pool noodles and refreshing beverages, I decided to stay in the shade of the bimini reading until 1:30 to give my skin a break from the midday sun after being out in it for a while as we were coming into the mooring field and picking up the mooring ball. After that I jumped in - snorkelling time again! There wasn't much to see immediately around our boat, but I found the deep channel that lead out to the reef that encloses thae harbor, and that was nice. What was really interesting was working over towards the mangroves that edge the land side of the harbor; we'd heard their roots described as fish nurseries, and sure enough, just off the mangroves, first there was a sort of miniature reef populated by miniature versions of the fish we've seen in deeper water, then eelgrass with even smaller fish -- tiny shiny things, I couldn't tell what kind. My turn to get followed by fish - it was totally unfair, our most novice snorkeller got bugged by a barracuda. What scary beastie decided to come after me? A bunch of mullet. Oooh scary (not). I'd gone from the reef back to the boat before heading over to the mangroves, and on the way back I passed a huge school of mullet and a group of about a dozen were apparently completely enamored of the yellow fins I was wearing, broke off from the school, and followed me back to the boat. Funny. They liked the shade of the dinghy and decided to stay there while I went to the mangroves, stayed there for quite some time. Snack and showers back on the boat, and then we jumped in the dinghy and headed into town a bit before 4. First stop seemed nice at first, Kat had heard that the Dinghy Dock Restaurant was a fun place to have a drink, so we stopped there. Everything started out fine, we got drinks and sat down at a table, all well and good. Things turned unpleasant fairly quickly, though. It started when Capt. Kat got to talking to a cruising couple - started out just wanting to say hi to their adorable little dog, but they were very friendly and seemed to know their way around and it occurred to Kat to ask them if they knew where we could get rid of our trash (we'd brought a bunch from the boat). The lady told us to just take it up the short flight of stairs that led from the bar to the street and we'd find some bins about a block away. Kat and I went and got the bags out of the dinghy and started heading towards the stairs, as suggested - but then this guy (who I thought was the owner because of his officious manner, but he wasn't, just somebody who's very comfortable being bossy with total strangers) got all huffy about it, and then as Capt. Kat tried to smooth things over with him, a couple more of the regulars started to get belligerent too - not much of a way to treat visitors. They shouted us back to our dinghy, which we took over to the town dock, as the first guy told us we had to do to get rid of our garbage, and then we went for a quick spin down the little canal that runs through the town to check out the restaurant (there, open, friendly owner brought a menu over to us to peruse and it looked very nice) and shopping opportunities (check). We then headed back to the bar, where we found out that the belligerent regulars had continued to verbally abuse the rest of our group (who tried to explain that we'd just been given bad advice, but the cranks were unwilling to be appeased). Our friends had looked to the staff for some assistance and not gotten any (they were setting up for a band so I guess they were kind of busy, but still...), and so the decision had been made that no more money was being spent there. The guy who'd started the nastiness had told Kat (who tried to settle him down by asking him for advice) that Mamacita's had at one time been owned by the Dinghy Dock owners, but they'd sold it to someone else and it wasn't the same - well, at this point, "not the same" sounded awesome, so we split and headed back to the canal. We went shopping first, we were running low on beer and (we thought) a few other odds and ends, so we took care of that; we even found Pringles here, hooray (this had been a running gag, Jenn and Kat and I all consider Pringles to be a most important salty boat snack and we'd been dismayed to find no Pringles at the grocery store in Red Hook)! We also met the prettiest kitty, a long-haired calico with one blue eye and one gold eye, she was so sweet, Jenn wanted to take her back to Brooklyn but settled for buying her a can of Fancy Feast at the grocery store (she was healthy and there was a gentleman at the store who did look out for her, but she was a bit on the thin side and she absolutely inhaled the food, I think it was a real treat for her). Groceries laded, we headed back to Mamacita's, where we had another scrumptious Caribbean meal and drinks (now in peaceful, friendly surroundings, ahhh). The canal is lit with blue underwater lights and besides the huge tarpon that are all over the place here in the town, we also saw large bats making regular passes over the lights, and when Jenn thought to look in the water under the patio where we were dining, she found a whole rookery of young spiny lobsters, plus a beautiful red and white striped shrimp. Great meal! One more odd encounter on the way back. We got pulled over by the Policia. They came up on us in a large and fast-looking speedboat with no running lights at all, which was a bit creepy, but when we told them we were just heading back to our boat out in the mooring field, they just asked us to add a light aft to the forward light we already had to make ourselves visible all the way around. Back at the boat, we had a couple more drinks with the rum cake Lenore had ordered at Bili's the day before for Dave's birthday today. Delicious! Early start to head to Culebrita tomorrow. Plans there are to hike to a lighthouse, go swimming, and try to eat some some of the excess food we're discovering we may have bought (we were definitely running out of beer but I think the odds and ends we'd thought we were short on just turned out to be stashed someplace other than where we'd thought they were). To bed now - is that a flock of oystercatchers flying around out in the dark out there? Sort of sounds like it! More pictures from the day - no more writing, click on the first one for slideshow view. Paul L Sieswerda is giving a talk about whales tonight at the National Lighthouse Museum on Staten Island. Sorry for the late notice! I'd hoped to go but can't make it because of work, but I thought I would share here. Special bonus activity if you go by public transportation - riding the Staten Island Ferry through the harbor ice to get there! Cool! Thursday 26 February – WHALES, Now and Then - Join us at the museum site on Feb. 26th when Paul Sieswerda, former curator of the New England and New York Aquariums and founder and director of Gotham Whale, will discuss current preservation efforts and whales in the New York Harbor area. Captain Joe Ahlstrom will discuss whales and how they are connected to lighthouses. This lecture will be held in Building 11 from 6-8 PM. Click here to read about the amazing whalewatching adventure my friend Patricia and I had with Gotham Whale last summer, yes, right here in NYC: Whale Break! Glorious, glorious, glorious. There were a lot of high points and very few low points on this trip, but our 1/22 evening visit to Mosquito Bay with the very nice and very knowledgeable folks at the Blue Waters Caribbean Adventures (Note: As of 8/20/2018, link doesn't work, see note at the end of the post) was definitely among the highs. It was sort of funny the way this got planned. I think I had first heard about these bioluminescent bays from my old friend Diane (Motherhood is Painless); she and her husband Dave (also an old friend, I met both of them in my early days of kayaking, which is getting to be a rather surprisingly long time ago) went to Puerto Rico in 2007 when she was pregnant with their first baby, Claire. They'd quite sensibly decided it would be a good idea to go have one last nice quiet vacation as a couple before becoming parents (eek), they chose Puerto Rico, and they came back with some good stories, including going out in this amazing bioluminescent bay. I don't really do the bucket list thing as in "Oh I must do this before I die or my life will not have been complete", but there is definitely a list of things that I think would be neat to do if the opportunity arose (that's actually how I ended up doing my solo paddle down the Hudson last summer, I'd had that in mind as something I'd like to do for years and all the sudden things just fell into place for it to happen last summer, so I did it) and after hearing Diane talk about this beautiful lagoon in Puerto Rico, seeing one of those for myself was definitely on that list. So there we were planning our trip in the back end of 2014. Capt. Kat was the one who was putting together our itinerary, and when she mentioned that one of our stops was going to be Vieques, not far from Puerto Rico, I went to google bioluminescent bays in Puerto Rico, and I think I'd typed about as far as "Biolumines..." when "Bioluminescent bay Vieques" popped up as one of the suggestions. Holy cow. 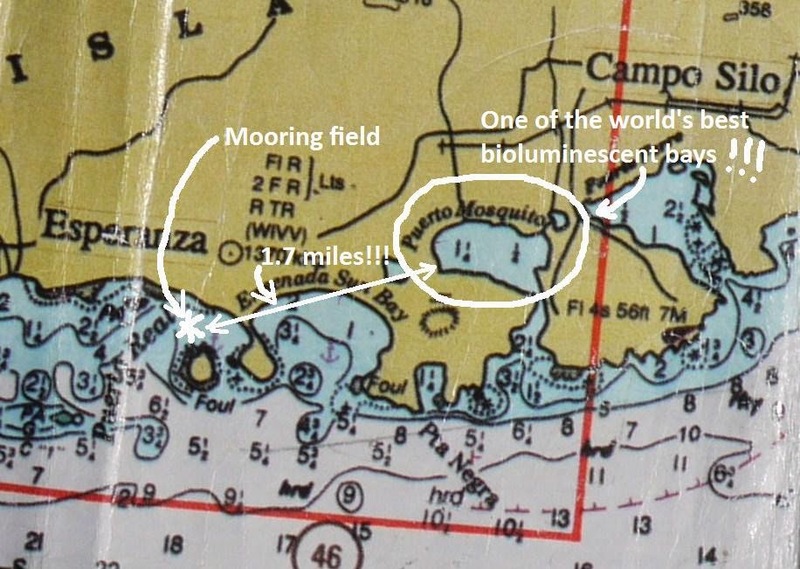 Here was the funny part - here I'd discovered that one of the world's best bioluminescent bays was right there on the island we were going to anyways, you would think that the next thing I would do would be to run squealing to my fellow travelers about this, right? Nah, wrong, I sort of froze up - Kat was doing such a wonderful job of planning the trip, you can't really just park a sailboat anywhere you want to, I didn't know if the bay would be anywhere NEAR a decent anchorage, and I didn't want to complicate things for her, even though it sounded really, really neat. Well, I think I would have suggested it eventually, but fortunately Kat beat me to the punch with a email to the whole gang saying "Hey, look, kayak trips on a bioluminescent bay, doesn't that sound really, really neat?" Well now that you mention it - WHY, YES IT DOES! WOOHOO! yippee yippee yippee! Less than 2 miles from our boat to the bay, as the crow flies. A bit longer as the van drives, because that ended up being how we got there - the bay is a prime tourist attraction, there are several companies offering trips there and they'll all pick you up in a van right on the main drag in Esperanza or at a park closer to the bay. You don't really want to drive in yourself, the road to the put-in is rough, and I'm not sure you'd be allowed to if you wanted to, access to the bay is pretty controlled as they want to keep it healthy and glowing. Our guides told us they had a pretty bad scare a couple of years ago when the bay went dark for a couple of months during a particularly cold winter, and you are also no longer allowed to just jump in and go swimming as research has shown that suntan lotion, bug repellent, and even just the natural oils and sweat on human skin can all be bad for the tiny creatures that create the glow. Seeing it by kayak was THOROUGHLY satisfying, though. We ended up with Blue Waters after a bit of hunting around on smartphones - someone (was it Chase, or someone earlier in the trip? I have to speed up these trip reports, details are already getting fuzzy) had told us that one of the outfitters used clear kayaks and that is was worth the extra money; we'd found them but they were already booked up for the evening. This actually worked out well because Blue Waters was really good - their guides knew a lot about the ecology and history of the bay, and in addition, they gave a nice overview of the local constellations and planets (which had been dazzling us every night of the trip). We signed up for the earlier of their two evening trips. After our afternoon snorkel, we went back to the boat to get ready (for me, that was mostly putting on my sunshirt and packing up a jacket in a drybag in case it got cool), then we all hopped in the dinghy to head to shore to meet our van. They'd asked us to be there at 6, which was a nice time to be going in - I know, I shared this picture yesterday, it was just so pretty! There were a bunch of people hanging out on the town dock, and there were also some lovely creatures hanging out under the dock - I was so excited to see this spotted eagle ray, they are such handsome animals and I'd never seen one outside of an aquarium. Lenore and Dave had spotted one while we were snorkeling that afternoon, but I'd missed it, so I was just so happy to see this one! Also, can you spot the green moray? I didn't realize I'd gotten him in this photo as well until I was looking at it back in Brooklyn. Click on the picture for a better view, as usual. Lower left-hand corner. Hint: He's green. The Blue Waters van met us right on time. We made one more stop to pick up more paddlers at Sun Bay, and then we went on the very bumpy ride to the put-in at Mosquito Bay. 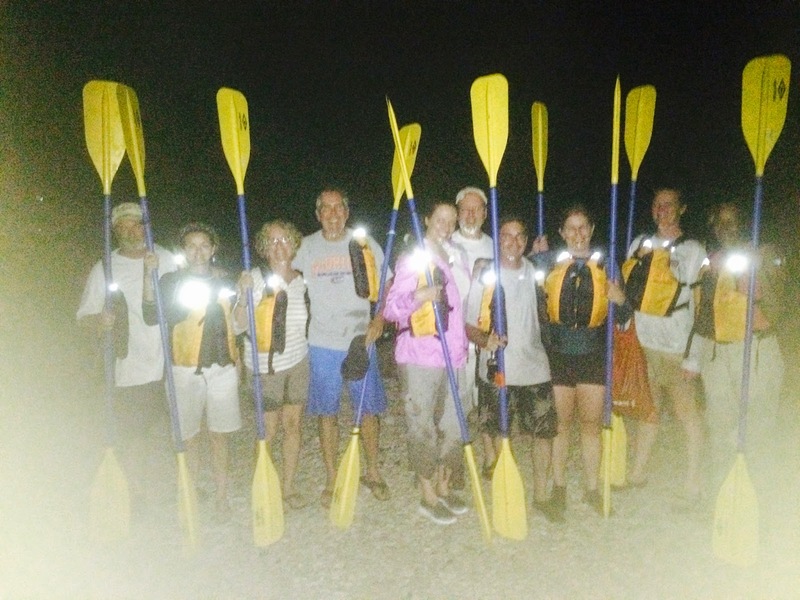 they popped us all into Ocean Kayak Malibu 2's and off we went! Our first stop was at a monitoring station a little ways out in the bay. Being lit, this was a nice clear destination, and also a good spot for our guides to start talking about the ecology of the bay. The station is there to measure pH and other water quality factors that are crucial to the health of the dinoflagellates that create the glow; the existence of a bioluminescent bay only happens when a certain set of requirements are met, and if those requirements stop being met, so does the beautiful glow. The dinoflagellates glow when the water around them is disturbed -- they don't know why, but they do, and it's amazing. It was still twilight as we paddled out to the monitoring station, but I was already beginning to see an odd shimmer around my paddle blades as we paddled. At first I thought it was just bubbles, but as it got darker, the glow got more pronounced. Sorry, I did try to take pictures, but it just wasn't something my little Optio could capture, you'd have to have a much more sensitive camera. The picture below was my last photo of the evening - our group's tail-lights as we paddled on out towards the narrow inlet to the bay. The guides' lights were blue, so you could see them easily, and they struck a good balance between letting the group relax a bit when we were on our own and tightening us up when we were passing other groups (would have been the easiest thing in the world for somebody to get mixed up and go off with another group but our guides were on top of things at all time). They were always calm and comfortable with their instructions, made for totally pleasant paddling. Good guiding! 1. The bay is called Mosquito Bay not after mosquitoes - we were afraid we were going to get eaten alive when we saw the name but I don't think I got a single bite - but after the boat belonging to a pirate who used to use the bay as a hiding place. 2. When the Spaniards came to Vieques, they thought the bay was haunted by an evil spirit; they tried to choke the spirit by filling in the already narrow inlet, not realizing that a narrow inlet is one of the things that makes a bioluminescent bay possible. Their efforts just made the bay shine brighter. What else - the dinoflagellates flash in response to water pressure changes, but scientists still have no idea why. The mangroves that line the shore of the bay also play a big role in creating the conditions in which the dinoflagellates thrive - clear those out to put in a resort and you'd kill the bay. Other bays have gone dark after their inlets were widened, and our guides mentioned that there'd been one that was ruined after a bar was built on the shore. Fragile things! There was more but I have to admit that I got sort of distracted playing with the water. Our guides started it, though! While we were rafted up, they told us to scoop up a handful of water, put the hand up in the air, and let the water run down your arm - your whole arm just glittered. The water bouncing in the scupper holes as your boat bobbed in the the water glowed as it splashed. I amused myself to a ridiculous degree by pretending to be a magician, closing my fingers in a loose fist underwater and then springing them open to create puffs of blue light - Alakazam! Sculling strokes became things of fiery glory (TQ and I were thinking what a wonderful way this would be to teach strokes - every motion of the paddle was traced in light!) and when I stuck my whole paddle underwater and stirred, it was a blue torch. As we began to to paddle towards the inlet, paddle strokes were punctuated with phosphorescent swirls, and when TQ briefly raced our head guide at a point when we were well away from other groups and could relax a little bit, our bow waves and wakes were an absolute fireworks show. Even better were the fish living there in the lagoon - when they would dart away ahead of us they would flash like streaks of lightning. Some of our group saw a small shark that put on a particularly good light show (I was sorry to miss that), and the ballyhoo were spectacular when they skipped themselves across the surface of the water (and in fact it was our guides who told us what the skipping fish were, we had thought they were flying fish when we'd seen then in Coral Bay). We paddled out to where the glow began to fade in the inlet, and then headed back, with a quick stop for the promised constellation review, which was also very good - got all the basics, plus several I either hadn't known or hadn't been sure about. After that, they took us back to the put-in, took our picture, and drove us back to Esperanza, with snacks and water in the van on the way back. What a great, great, GREAT way to spend an evening! We toasted the day back on the boat with rum (that's right, the rum turns out to NOT always be gone) and ginger ale and wine. A pretty damned good day! Click here for an interesting article about when the bay went dark. Also, here's a history page with a little more about that pirate. Enjoy - and if you ever get a chance to go there, don't be shy - GO! OK, it's cold again so I'm going to go back to my Caribbean trip postings - will have to take another break to post about Justine Curgenven's March talk at Sebago (yes, http://THIS Justine, she is coming to visit us all the way out in Canarsie on evening of March 26th) but tonight I want to look at pretty pictures of someplace warm again! 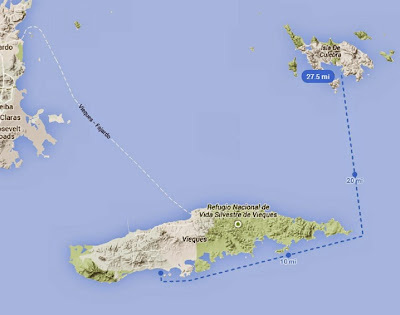 1/22 continued: We had great plans for the evening, but we had a few hours to play with before it was time to go meet our guides for that, and Chase had said that there was great snorkeling around the islet out in the harbor, so we decided to go check it out. Chase said that usually you could see 200 feet, and he'd seen manatees out there; visibility wasn't near that good on this day, and the manatees were elsewhere, but it was still a nice spot, and there were lots of fish, and there were three boobies on a rock, and then there was a beautiful rainbow, and then we went over to a sloop that had been scuttled in the bay a for a quick "wreck dive", and then (and here as I was writing I was laughing to myself because I was sounding like Jacob, who loved to tell stories that went "and then, and then" - boat was mighty quiet without that young man, we missed him!) we came back to the boat and got ready for the most exciting part of the day, a kayak trip on one of the best bioluminescent bays in the world! Photos from the the afternoon follow. Interesting thing is that I actually didn't take that many snorkeling pictures, I was actually surprised how few underwater pictures I had when I went through them tonight. I think I felt like I'd already taken an awful lot of fish pictures, and sometimes it is good take a break from the picturetaking in favor of actually looking with your eyes - know what I mean? The few that I did take, I was mostly just trying for get better photos of a couple of my favorite kinds here, which happen to be very quick-moving little guys, but lovely - the blue-head wrasse and the tiny but absolutely stunning juvenile yellowtail damselfish, who look like something made by a very skillful jeweler, with their midnight blue bodies flecked with lighter blue spots that look exactly like blue opal chips. snorkelstjohn.com has a little more info about the yellowtail damselfish, and some shots that do them much more justice - oh, and I was finally able to ID them using a very well-organized site that TQ found while trying to identify his fish photos, reefguide.org. No more writing, click on the first photo for a nice slideshow view.